A healthy smile often speaks more than a thousand words. However, dental emergencies like chipped teeth, fallen crown, gum injuries etc. get worse when ignored; resulting in permanent damage in some cases. Hence, in order to protect the precious smiles of your loved ones, it is best to keep some phone numbers of emergency dentists handy. At inopportune moments, dental emergencies need immediate attention and extensive care. Emergency dentists and dental clinics in the Dallas metro area provide you just that as they remain open twenty four hours a day. Those of us who have packed schedules on weekdays often need to brush up on our dental health and hygiene, but seldom have time. For them, emergency dental clinics remain open on weekends for a quick visit. Therefore, consulting an emergency dentist near you can prevent long-term damage to your precious teeth. Situated in Denton County, Texas, Lewisville happens to be one of the fastest growing cities in the United States. The city’s origin dates back to early 1980’s when it was once called Holford’s Prairie. Currently, Lewisville is a bustling city of 95,290 people. For the people of this city, there are many emergency dentists catering to their dental needs. For sudden dental emergencies, it is best to note down some contact numbers of emergency dentists. 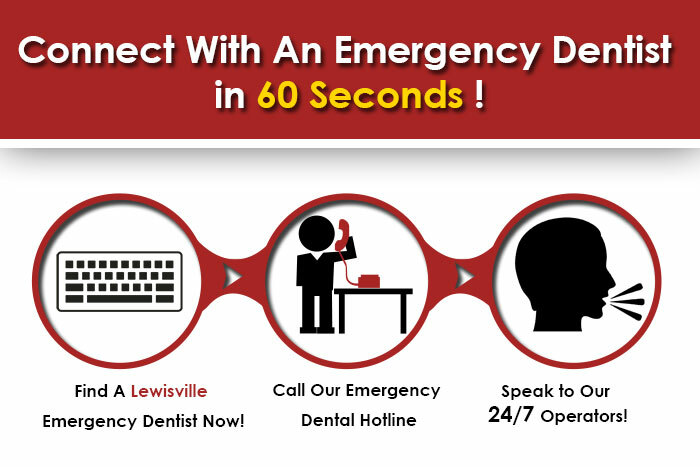 Below is a list of emergency dentists for the residents of Lewisville. Dr. Natalie Goodman’s dental practice- The Lewisville Dentist is reputed for delivering quality dental care to patients. She and her experienced team believe that good oral health and hygiene can be achieved by lifetime care. They provide customized care for each of their patients and offer services such as sedation dentistry, family dentistry, root canal, implants and cosmetic dentistry. Her chamber is at 297 West Round Grove Road, Suite 127. Book your appointments at 469-289-5563. Coppel Modern Dentistry and Orthodontics are very responsive to telephone calls and promise the least wait time for patients. Emergencies are taken very seriously and same day appointments are made. Their state of the art facility is located at 30 N Denton Tap Rd Ste 115. Their hotline is 972-393-9933. Dr. Moji Chandy listens to her patients and treats their dental problems with the utmost care. Her services are for people of all ages, in particular young children and the elderly, who are treated with a gentle touch. Services provided are regular and deep cleaning, tooth colored fillings, affordable dentures, root canal, in-office zoom whitening, extractions, nitrous oxide sedation, crowns/bridges etc. Located at 4125 Fairway Drive #100, their hotline 972-492-6700 promises prompt emergency response. Maria Mendez is the manager of Jefferson Dental in its Lewisville location, situated at 701 S Stemmons Fwy #270. The clinic staff under her leadership arrives at work with huge smiles, ready to greet patients and providing them a relaxing, comfortable and painless experience. Services they provide include pediatric dentistry, tooth veneers, whitening, fillings and emergency services. Call them at 561-684-5800.